Technology is touching the nine sky, it is rising like a huge tide in the tempest, if one does not keep pace with it, it actually turns him down and knocks him out of the list, that’s what is seen most commonly in the world of advancement where to make yourself stand out, you need to follow the suit of latest conventions and techniques. In the world of cyber where people have already done abundance of work, and when you try to go overboard you see you don’t stand anywhere on the top, for this you need to upgrade your blogs/websites so the search engines show you due consideration and mark you as really “something” in the top charts. Making your website noticeable you really have to pop it up with what is truly latest and handy. Your skill and competence show through your work so it is the time to make your name through the best way possible. Responsive themes give a tremendously appeasing look to a blog; it captures the attention of more viewers. Giving a refreshing and appealing look to your blogs, through free responsive wordpress themes is commendable and you will get the result as a great “turn-out”. 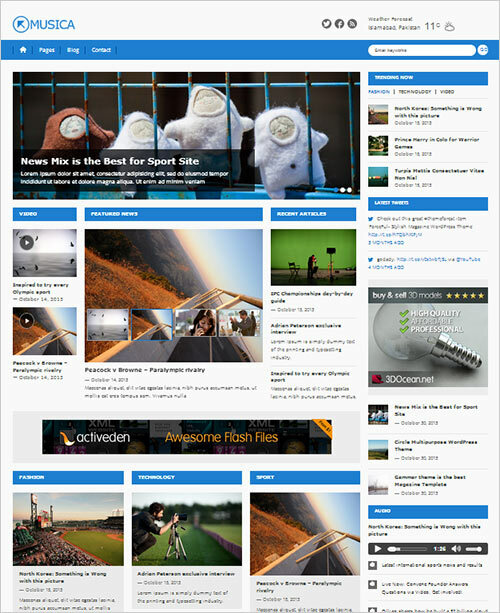 Today I’m unleashing top 12 best free Responsive WordPress themes 2014. If you are a beginner in the field of blogging, any of these themes will give a boost the aptitude and caliber of your respective website/blog & you won’t be in need to work an extra mile to make your recognition possible. Give a vigorous touch to your blogs and websites so that the readers feel friendly towards your podium. By having any of these Responsive themes mentioned downright, enlarge your work horizon. Don’t forget, it is a marathon race and in order to beat down your fellow opponents you need to sweat a bit with these tactics. Take it away! 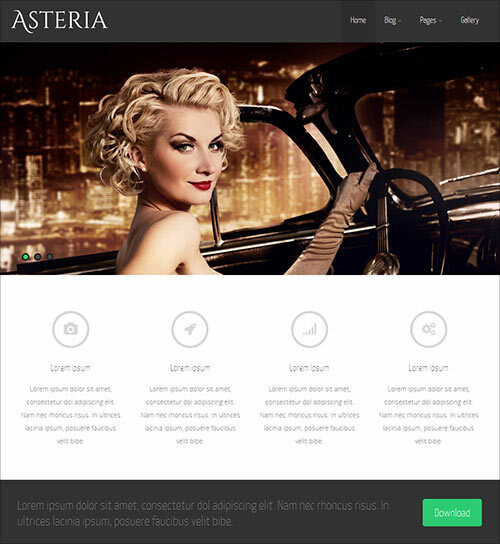 Asteria Lite is a simple business responsive WordPress theme with wide layout, image gallery and 3 page templates. It also has a full width page, Left sidebar page and a Blog page Template. Asteria WordPress Theme also has a Maintenance Mode feature, Custom CSS feature, Import/Export and is fully compatible with Woocommerce and Contact Form 7 Plugin. It has also shipped with Ajax pagination feature which means you can navigate through posts without page refresh. 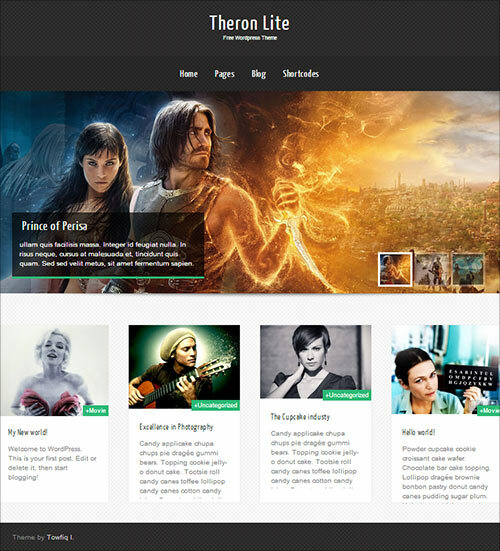 Asteria Lite is best for any niche website – corporate, business, portfolio. Theron Lite is a responsive WordPress theme with 3 fonts, beautiful slider, custom background image extensive admin panel theme. Theron has 3 built-in widgets and 5 handy shortcodes. The theme is optimized for search engine and has adequate user friendly options. Theron Lite free responsive wordpress theme has a Blog Template, Full-width page, Left Sidebar Page, Home Page template and a Contact page Template that does not need any setup. Theron Lite is appropriate for any commercial or personal website. Theme is fully responsive as well. 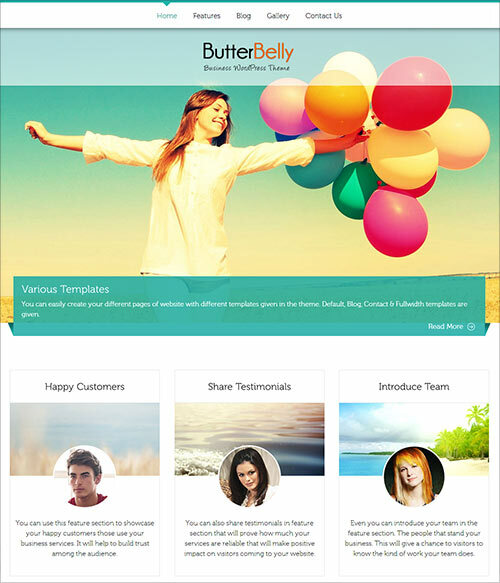 ButterBelly WordPress Theme is a beautiful Wp theme with a lot of premium options like logo insertion, intro texts and custom background. ButterBelly Theme includes with 5 widgetized areas (two in the sidebar & three in the footer) including featured images (thumbnails for gallery posts and custom header images for posts and pages). It also comprises with stylesheets for print and has full page template. 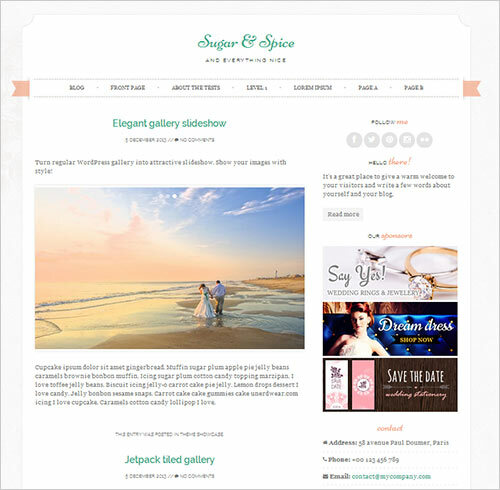 Sugar & Spice is a girly WordPress theme designed for wedding blogs. Admin panel options include logo and favicon, unlimited colors and custom background. Sugar & Spice has three layout options and it is fully responsive and looks awesome on iPad, iPhone and other mobile devices. It can also be used for bakeries, elegant photography, makeup industry, event management, photographers or florists. It’s time to present your company stylish! Hueman responsive wordpress theme is fully customizable and looks absolutely beautiful on iPad and iPhone as it looks on full screen makes it exclusive reading experience. Admin options consists many premium features like Unlimited topbar, header, footer and unlimited colors, unlimited widget areas, 0-2 sidebars, fixed width sidebars, 4 footer widgets, 10 post formats, search engine optimized ready, localisation support, social media icons & links, logo upload and many other fancy features. 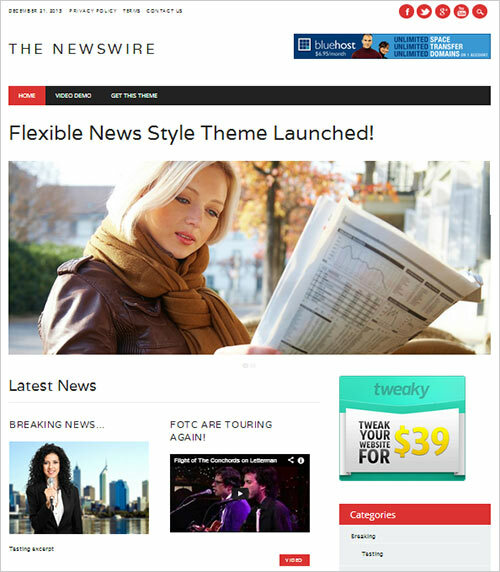 The Newswire theme is also simple responsive magazine WordPress theme for your upcoming 2014 blogs. 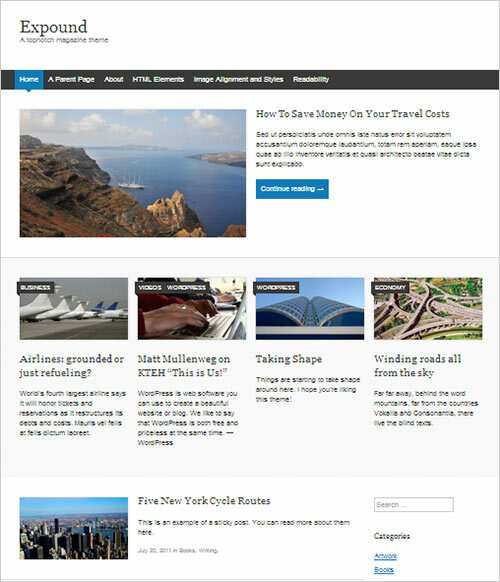 It is perfect for news websites & Blogs. It has a large image slider and after that lastest blog posts in 2 columns and a siderbar. Option panel will let you upload you logo can change fonts colors. It also have custom background support without coding, two custom menus, top header banner and sidebar from the customize menu. It works perfectly on iPad, iPhone & Desktop resolutions. Nictitate is a Free Responsive Ecommerce WordPress Theme which is designed for magazine websites best suits for corporate business. Nictitate theme has a KOPATHEME layout manager that will let you select layout options of each page. Nictitate has a layer slider and it can be completely turned into ecommerce website. Musica is a Fully Responsive wordpress theme Built with Boostrap and it is retina ready, HTML5 and CSS3 tableless design, 12 Validated and well commented HTML5 Pages, Contact Page with Ajax/PHP Contact form, shortcodes & Google Web Fonts are included. Fontfolio is a responsive grid-based wordpress theme, perfect for photographers, illustrators, designers to showcase their artworks. 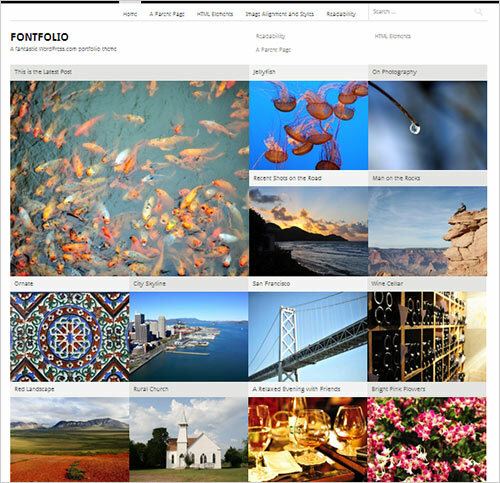 Show off your best work with large Featured Images. It also included 2 custom menu areas, support for multiple post formats, search field & social network icons. Expound is a free simple responsive wordpress theme that offers a fresh, clean, minimal magazine-styled layout perfect for beginners. It looks great on mobile devices as well as any desktop resolution. 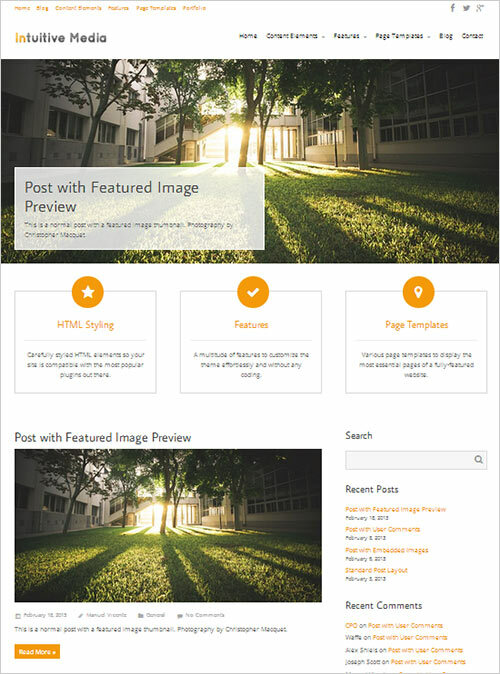 It supports post formats and featured posts that make the content look simple and professional. 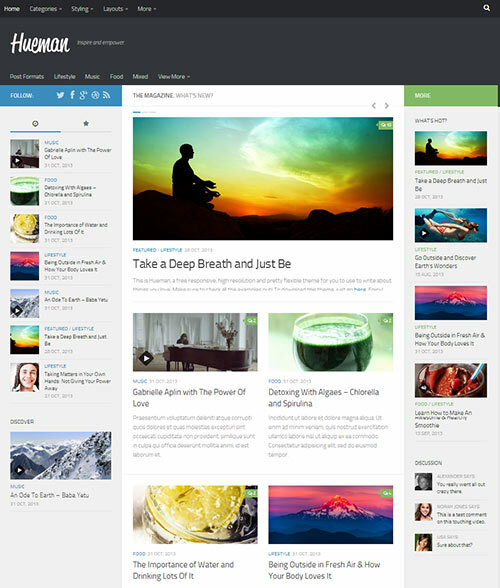 Intuition wordpress theme is mainly focused on professional blogging & showcasing services for serious bloggers. It has a full width home page animated slider that can be picked from featured posts & pages images. 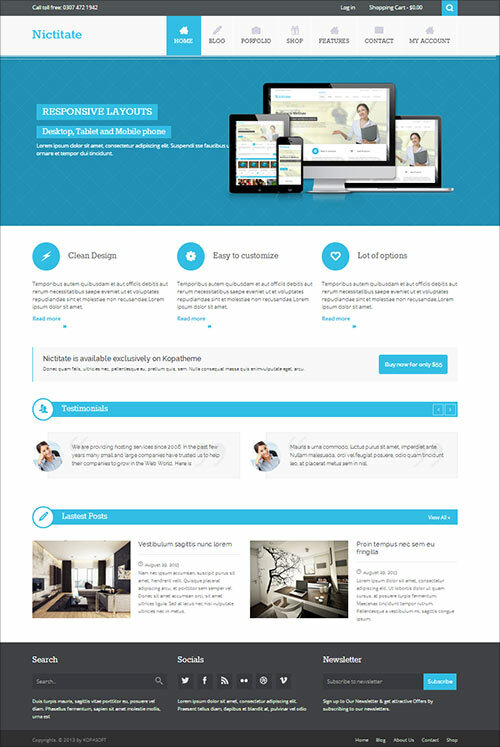 Intuition is optimized for retina display and fully responsive wordpress theme. It will look great on any device. Intuition is made to incorporate WPML for translation, Yoast SEO & Contact Form 7. 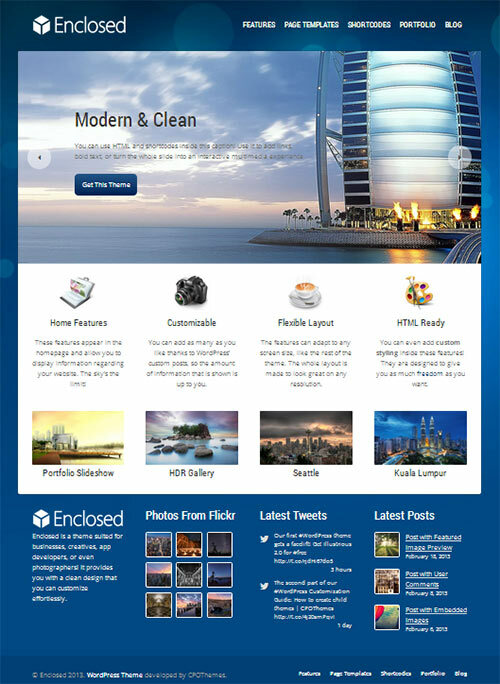 Enclosed is a clean beautiful wordpress theme with modern look and feel. The Content of Enclosed theme is easily readable and appealing. It has a lot of premium features ideal for pro bloggers and photographers that can showcase their best projects. Enclosed has a simple and elegent home page with smooth homepage slider that can be used to show work, services, upcoming projects, articles or products. You can add as many sliders as you want. Nice themes thanks for sharing this lovely stuff. Nice list. I downloaded the Theron one and it is very nice looking with great customizable features. I didn’t see it anywhere else, so thanks a ton. Nice templates and themes. Good design. Nictitate is my favorite. Awesomes collection of best free responsive themes . I really like the design and features of Nictitate theme. I myself will start a website sometime in November for giving away premium quality themes but right now i have a site of free WordPress themes with Woo Commerce features and Portfolio options. I hope you will like it! Thanks for the great list of Responsive WordPress themes. Really nice collection of responsive WordPress theme, I am using another WordPress theme named B.Blog WordPress Photography theme, This one of marvelous retina ready Photography WordPress themes works smoothly across popular web & mobile browsers and provides ultimate flexibility with “A” grade performance.